The first Amazing Spider-Man film was ultimately pointless, simply rehashing the same origin tale that's been told time and again. At least the fresh-faced cast showed some promise. Thankfully that promise is fulfilled with the sequel, though it does somewhat suffer from the same flaws. As with the first film, the tone is suitably adolescent to match Andrew Garfield's teenage Peter Parker. On the one hand this lends the film a lighthearted feel to match its colourful, comic book origins. On the other, this leads to a film full of comedy - from the cartoonish use of music (from Hans Zimmer no less), to comic quips and even ironic use of the original theme song as Peter's ringtone. There's also heavy reliance on cliché that's comic when it shouldn't be. The story sees Peter discovering the reasoning behind his parents' death, balancing his duty as Spider-Man with his teenage duties of graduating college, getting a job, and maintaining his relationship with his girlfriend. It's an obvious narrative, that along the way includes a laughably mad German scientist, a secret base and some unintentionally amusing one-liners. Jamie Foxx's Electro is perhaps the biggest cliché of them all. He begins as a typically geeky, shy and unknown scientist who, after gaining his powers, is reborn as an electricity shooting Frankenstein creature - misunderstood, yet angry as hell and weirdly obsessed with Spider-Man. There's a second villain too, but not only is this too heavily reliant on knowledge of the previous film, it's one villain too many. 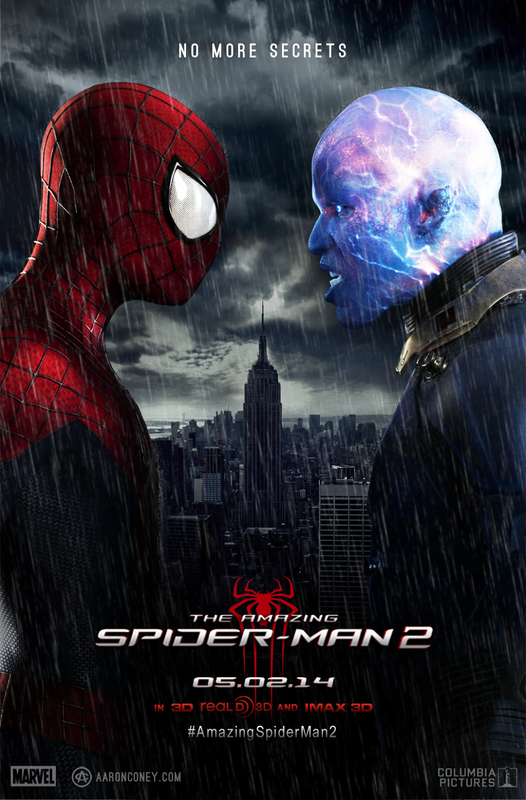 What Electro does allow for is some spectacular CGI. Foxx's eyes glow as electricity courses through his veins, whilst heavy use of slow motion allows us to see the true impact of his powers. It culminates in a brilliant final battle that's intense and impressive, though it's Spider-Man himself who impresses most of all. The camera swoops between buildings as he flips through the air and you really get a sense of this boy having fun with his powers and how exhilarating it would be to step into his web-slinging shoes. Most of all, though, it's the female characters that ensure there's human depth to the narrative. Sally Fields steals the film in one swoop as Aunt May, a surrogate mother torn between loving and protecting her nephew. And as Gwen Stacy, Emma Stone continues to allude the typical damsel in distress. It's her on-screen chemistry with Garfield, real or no, that separates this film from its predecessors.